>> "CREATIVE LIVING," UTILIZING TODAY'S TECHNOLOGY WITH THE BEST OF THE PAST TO BRING YOU INNOVATIVE IDEAS AND UP-TO-DATE INFORMATION FOR CREATIVE LIFESTYLES IN TODAY'S ACTIVE WORLD WITH YOUR HOST--SHERYL BORDEN. >> I'M SO GLAD YOU JOINED ME TODAY FOR "CREATIVE LIVING." WE'RE GOING TO LEARN HOW TO MAKE A BEAUTIFUL SUNFLOWER CENTERPIECE AND DEMONSTRATE WORKING WITH PAINTED QUILT BLOCKS. ONE OF MY NEXT GUESTS IS CASEY SCHWARTZ, AND SHE'S A FLORAL DESIGNER AND CO-OWNER OF FLOWER DUET IN REDONDO BEACH, CALIFORNIA. CASEY'S GOING TO SHOW HOW TO MAKE A BEAUTIFUL SPRING SUNFLOWER CENTERPIECE USING SPIDER MUMS, SAFFRON, AND, OF COURSE, SUNFLOWERS. 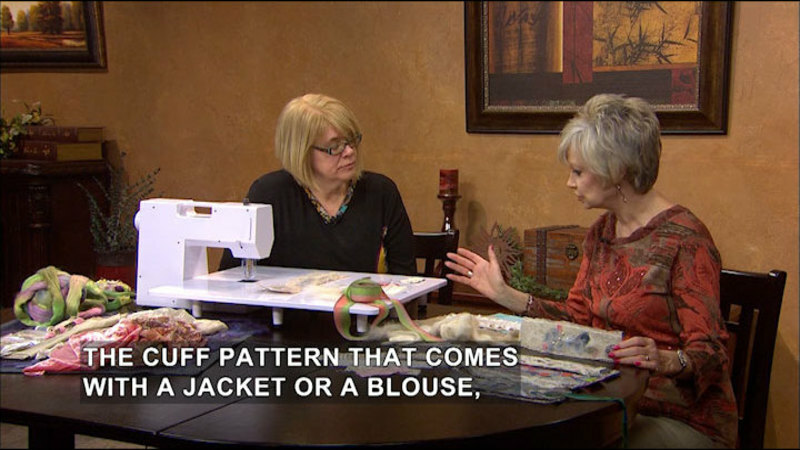 WE'LL BEGIN THE SHOW WITH LAURA MURRAY, WHO IS A QUILTER AND DESIGNER FROM MINNEAPOLIS, MINNESOTA. LAURA WILL DEMONSTRATE PAINTING QUILT BLOCKS TO CREATE A ONE-OF-A-KIND DESIGN. SHE HAS LOTS OF FINISHED ITEMS, INCLUDING A WALL HANGING, A FRAMED PICTURE, AND A JEAN JACKET TO ILLUSTRATE HOW TO DO THIS TECHNIQUE. SHE'LL SHOW HOW SHE USES PAINT-STICK PRIMER AND WILL SHARE SOME GREAT TIPS FOR SUCCESSFUL RUBBINGS AND VARIOUS COLOR STRATEGIES. AND IF YOU HAVEN'T WORKED WITH PAINT STICKS BEFORE, THEY CREATE SUCH BEAUTIFUL COLORS, AND THEY'RE EASY TO WORK WITH. LAURA'S COMPANY IS LAURA MURRAY DESIGNS. LAURA, THANK YOU SO MUCH FOR BEING WITH US TODAY. I LOVE THE WAY YOU WORK WITH SUCH BRIGHT, INTENSE COLORS. YOUR QUOTE CRAYONS, OR, REALLY, PAINT STICKS, ARE BEAUTIFUL. AND THE WAY YOU CREATE FABRIC TO USE IN QUILTING IS VERY UNIQUE. >> THANK YOU. I'VE HAD A GREAT TIME. >> I BET YOU DO HAVE FUN DOING THIS, BUT YOU DON'T DO PIECING. >> NO, NOT WITH THIS TECHNIQUE, I DON'T. I FIGURED OUT HOW I CAN JUST PLAY WITH COLOR. >> JUST PLAY WITH COLOR. I LIKE THA--I MAY TAKE THIS UP, THEN. LET'S GO AHEAD AND SHOW A FEW EXAMPLES. WE CAN EVEN DO THIS ON READY-TO-WEAR IF WE DON'T WANT TO DO QUILTING. >> YES. THAT IS SQUARES. 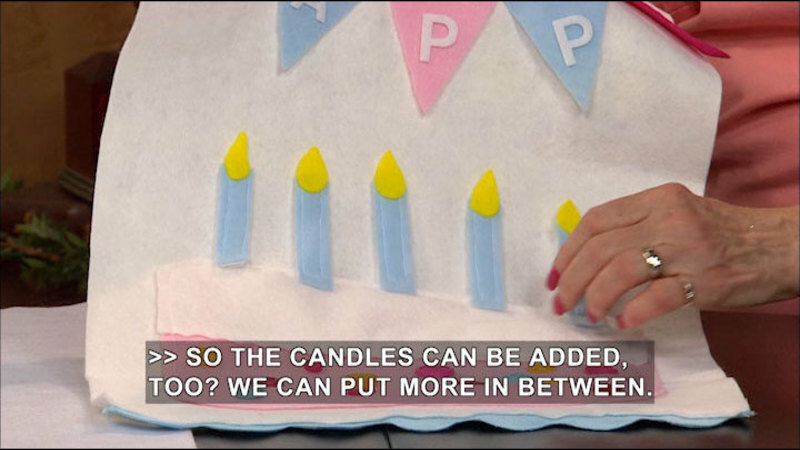 THINK OF IT LIKE MAKING A TIERED LAYER CAKE. THERE ARE 3, UH, SQUARES OF DIFFERENT SIZES, LAYERED ONE ON TOP OF ANOTHER ONE, TO CREATE THAT EFFECT. >> UH-HUH. >> AND THOSE ARE ANOTHER SAMPLE. BASICALLY WHAT I'M DOING IS MAKING--IT'S A TRADITIONAL GEOMETRIC DESIGN, WHICH IS WHAT QUILT BLOCKS ARE, WITHOUT DOING THE PIECING. I AM PAINTING, WHICH WE'RE GOING TO DEMONSTRATE HERE IN A MINUTE, AND LAYERING MY SQUARES, AND SOME OF THEM GET CUT INTO TRIANGLES, AND VOILA. >> VOILA. >> VOILA. >> THESE ARE ALL BEAUTIFUL. >> AND THIS LITTLE QUILT IS CALLED A QUADRILLE. IT IS THE SAME CONCEPT. THERE IS NO PIECING AT ALL. ACTUALLY, SEWING DOES COME INTO PLAY WHEN I GET TO THE QUILTING PART, AND IT IS QUILTED IN THE USUAL WAY, BUT THE TOP IS DONE COMPLETELY WITHOUT SEWING. >> AND WE'RE GOING TO SEE HOW WE MAKE THESE BEAUTIFUL COLORS. OH, THIS IS PRETTY. >> AND THIS ONE IS CALLED FIESTA, AND THIS IS A VERY SIMPLE--JUST LAYERED SQUARES, BASICALLY. >> JUST LAYERED SQUARES. >> YEP. >> YOU MAKE IT SOUND SO EASY. >> IT IS. IT IS JUST AS SIMPLE AS PUTTING ONE SQUARE ON TOP OF ANOTHER SQUARE. THIS ONE IS ACTUALLY A SAMPLER WHICH I USED IN MY LATEST QUILT PAT-- IT'S CALLED PAINTED QUILT BLOCKS PATTERN WHICH SHERYL HAS THERE, AND THAT PATTERN WILL TAKE YOU THROUGH ALL THE STEPS REQUIRED TO DO THOSE BLOCKS. >> AND IT'S A BEAUTIFUL PIECE. AND IF WE AREN'T INTO QUILTS OR WALL HANGINGS, WHAT A CLEVER IDEA. FRAME IT. >> THING ABOUT THESE DESIGNS, THERE'S NOTHING WRONG WITH JUST FRAMING IT AND PUTTING IT ON THE WALL. YOU DON'T HAVE TO PUT IT INTO A QUILT. >> I MIGHT WOULD FRAME MY VERY FIRST ONE IF I EVER FINISHED IT. OH, THIS IS REALLY A CUTE IDEA. 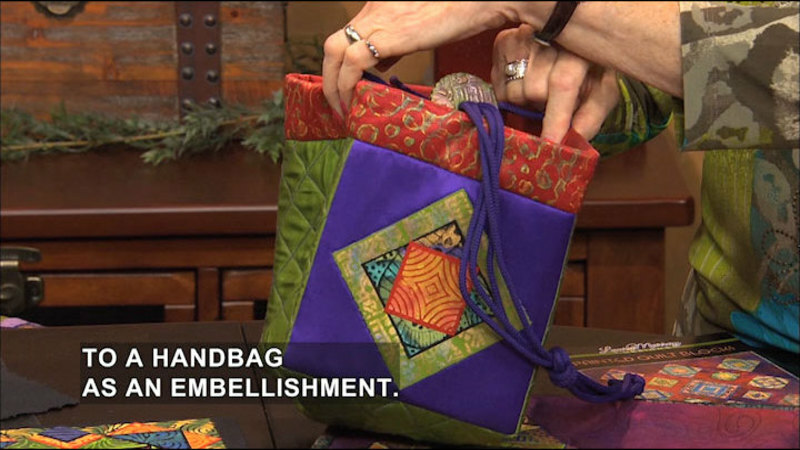 >> OR YOU COULD TAKE THOSE BASIC BLOCKS, AND YOU COULD FUSE THEM TO A HANDBAG AS AN EMBELLISHMENT. >> WELL, THAT'S A GREAT IDEA. >> MM-HMM. >> TOTE BAGS OF ALL SIZES ARE SO POPULAR. >> MANY, MANY OPTIONS AVAILABLE. >> OK. HOW DO WE START DOING THIS? >> WE START DOING IT BY HAVING A STAMP. THIS IS A STAMP THAT I'VE DESIGNED CALLED XANADU. IT HAS ALL OF THE NECESSARY SHAPES TO MAKE WHAT YOU SEE THERE. AND YOU NEED PAINT STICKS. I HAVE AN ASSORTMENT HERE OF LOVELY COLORS. THERE-- >> AND THEY COME IN, LIKE, 20-- >> THERE'S 21 BEAUTIFUL--COLORS. THERE'S JUST A FEW HERE. I LOVE THE SHEEN... >> I DO, TOO. >> ...OF THE IRIDESCENT COLORS. WHEN YOU WORK WITH PAINT STICKS, IT'S OIL PAINT IN STICK FORM. ALWAYS NEED TO REMOVE THE SKIN FROM THE SURFACE. 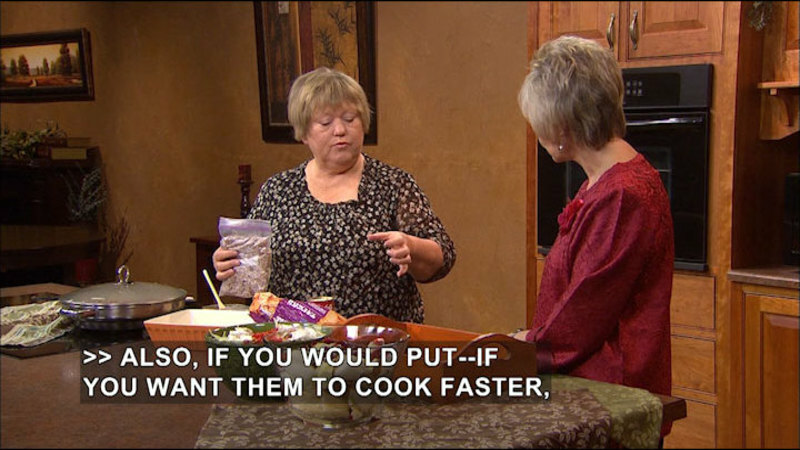 YOU DO THAT BY JUST PUTTING IT INTO A NAPKIN, PINCH, AND TWIST. IT SELF-SEALS AS SOON AS YOU'RE FINISHED. >> SO THESE JUST STORE JUST LIKE THAT. >> THEY COULD. I JUST KEEP THEM IN LITTLE PLASTIC BASKETS AT HOME. >> THAT'S A GOOD IDEA. >> THEN, WHEN I GET READY TO DO THE RUBBING. THE FIRST THING I WOULD DO IS SPRAY THE TOP OF MY STAMP WITH A TEMPORARY SPRAY ADHESIVE SUCH AS-- >> SO THE FABRIC DOESN'T SHIFT. >> SHIFT. YES. ON THIS COMPLEX DETAIL, IF IT'S SHIFTED, YOU START OVER. YOU'RE NEVER GONNA LINE THIS THING UP AGAIN. SO IT JUST MAKES SENSE TO KEEP IT FROM DOING THAT IN THE FIRST PLACE. MY FABRIC GOES ON TOP. >> NOW, WOULD YOU CUT YOUR STAMP APART OR LEAVE IT? >> NO, I DO NOT BECAUSE IT IS-- EXACTLY RIGHT. IT'S EASIER TO WORK WITH, AND I WANT LOTS OF SPARE PARTS. THIS IS LIKE PLAYING WITH LEGOS. THE MORE YOU HAVE, THE MERRIER, AND THE MORE YOUR OPTIONS ARE. FABRIC GOES ON TOP. I'M GOING TO DO JUST A VERY QUICK LITTLE RUBBING HERE. >> DO YOU ALWAYS USE A COTTON OR CAN YOU USE-- >> I DO, FOR THIS PURP-- YOU COULD. PAINT STICKS WILL WORK ON ANY POROUS SURFACE, BUT FOR THIS PURPOSE, I THINK A NICE, TIGHTLY WOVEN COTTON IS OUR BEST BET AND ALSO CHEAPEST. WE WANT TO USE BRIGHT COLORS, LIGHTS, MEDIUMS, AND DARKS. YOU CAN SEE--LIKE, ON THIS, YOU CAN SEE THE LIME-GREEN FABRIC THAT WAS BEHIND IT. YOU CAN SEE THIS WAS RED, AND I'M ABOUT TO DO ONE ON BLACK. WHAT I'M GOING FOR HERE IN MY PIECES THAT I'M PAINTING, I WANT A VARIETY OF LIGHTS, MEDIUMS, AND DARKS. >> OH, OK. >> CONTRAST. THAT'S REALLY ALL I CARE ABOUT. IT'S NOT A COLOR THING. IT'S ABOUT CONTRAST. THE WAY IT WORKS IS THAT YOU MAKE SURE THE FABRIC DOESN'T MOVE, YOU HOLD IT, AND YOU TAKE LITTLE, SHORT, QUICK STROKES. AND YOU DO IT MULTIPLE TIMES. >> GO BACK OVER ITSELF. >> ALWAYS IN ONE DIRECTION. ONE OF THE BIGGEST PROBLEMS PEOPLE HAVE WITH USING PAINT STICKS IS THEY--YOU HAVE TO GET RID OF YOUR INSTINCT TO COLOR. >> THAT'S WHAT I WOULD I THINK-- >> EVERYONE DOES BECAUSE WE HAVE MUSCLE MEMORY FROM WHEN WE DID IT WHEN WE FIRST LEARNED HOW TO COLOR. HERE, YOU NEVER WANT TO GO BACK AND FORTH. IT MOVES THE FABRIC, AND THAT IS A BAD THING. SO, I CAN GO RIGHT OVER THE TOP. I CAN CREATE THESE MULTI-COLORED EFFECTS LIKE THIS. AND I COULD KEEP GOING WITH THIS, BUT THIS SHOULD SUFFICE. >> YOU COULD PUT PINK AND PURPLE AND WHATEVER YOU WANTED TO-- >> I COULD DO JUST ONE COLOR, WHICH IS WHAT YOU'RE SEEING HERE. THAT'S JUST ONE COLOR. >> THAT'D BE EASY TO START WITH. >> LIGHT GOLD ON RED. IT'S VERY EFFECTIVE. MY NEXT STEP WOULD BE THEN TO TAKE, UM, THESE PIECES. >> OH, THIS IS WHAT YOU JUST WOULD'VE FINISHED. >> IT'S BETWEEN 2-- I'M USING LIGHT STEAM-A-SEAM 2 HERE, WHICH IS THIS PRODUCT. IT'S PRESSURE- SENSITIVE. IT'S GOT A TEMPORARY STICK FEATURE, WHICH COMES IN VERY HANDY DURING THE ASSEMBLY PROCESS. AND WHEN I FUSE THEM... >> YOU'RE TURNING IT OVER. >> I'M TURNING IT OVER BECAUSE WHAT I WANT IS TO BE ABLE TO SEE THAT THIS WEB HAS ACTUALLY MELTED. IT JUST TAKES A FEW SECONDS, AND IT CHANGES COLOR. THAT WAY, I AM NOT CUTTING AND FINDING OUT THAT SOMETHING DIDN'T GET MELTED THE FIRST TIME THROUGH. >> AND YOU USE A HOT-DRY IRON, NO STEAM. >> HOT-DRY IRON. I REMOVE THE TOP SHEET, AND THEN IMPORTANT THING TO NOTICE ABOUT THIS IS WHEN I CUT THESE OUT, I AM LEAVING A LITTLE NARROW EDGE OF COLOR. >> OH. >> I'M NOT CUTTING RIGHT ON THE LINE. I AM LEAVING THIS LITTLE NARROW EDGE. IT'S ABOUT 1/16-INCH OF A-- >> AND WHY DO YOU DO THAT? >> I DO THAT BECAUSE IT GIVES ME COLOR SEPARATION FOR THE NEXT STEP. >> OH. THAT'S A GOOD POINT. >> IT ALWAYS SMUSHES TOGETHER AGAIN. SO WE'LL JUST GET THIS OUT OF THE WAY, AND I'M GOING TO MOVE TO MY LITTLE SAMPLE HERE. AND I'M GOING TO BUILD A BASIC BLOCK. >> AND I NOTICED--I WILL COMMENT JUST BRIEFLY--YOU CAN GO AHEAD AND START WORKING WITH THIS FAIRLY SOON, BUT YOU REALLY, AFTER YOU FUSE IT, DO YOU NEED TO LET IT SET AFTER--AT THAT POINT, OR ARE YOU READY TO GO? >> I LIKE TO WAIT ABOUT 24 HOURS BEFORE I PUT THE FUSIBLE WEB ON. IT'S A PRACTICAL MATTER. I DON'T LIKE IT COMING OFF ON MY HANDS. I COULD DO IT RIGHT AWAY, BUT-- >> IT'S NOT MESSY TO WORK WITH. DOES IT SMEAR? >> WELL, IT WILL, YES. YOU DO THIS ENOUGH, YES, PAINT STICKS WILL--YOU DO THIS, YOU WANT TO COVER YOUR WORK SURFACES WITH PLASTIC. IT WILL GET ON YOUR HANDS. IT WILL GET ON YOUR CLOTHES AND THE FLOOR, SO... >> THANKS FOR THE WARNING. >> IT'S NOT LIQUID, BUT THAT-- THOSE LITTLE BITS OF SKIN WILL ATTACH THEMSELVES ALL OVER THE PLACE. >> THAT'S GOOD TO KNOW. >> YES. SO HERE, THEN, I'M GOING TO--THIS IS MY--I CALL THIS MY SET OF 4. WHAT I'M WORKING WITH IS A 1 3/4-INCH BLOCK, AND THERE'S A SET OF 4 HERE. 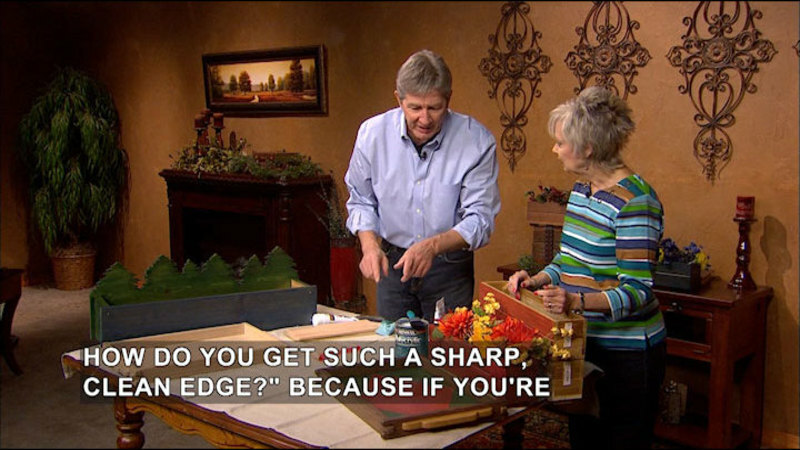 AND YOU COULD SEE THIS NARROW EDGE. SO THIS IS--BACK TO THE CAKE ANALOGY, THIS IS THE BOTTOM OF MY CAKE. MY BOTTOM LAYER. MY SECOND LAYER, THEN, I WOULD TAKE A 2 1/2-INCH STAMP, WHICH WOULD BE THE SIZE THAT I DID THE LITTLE DENTAL ON BACK THERE. IT WOULD BE ONE OF THESE. AND IT WOULD GO RIGHT ON TOP. I WOULD CENTER IT ON TOP. I REMOVE THE PAPER, AND I CAN JUST STICK IT RIGHT ON... >> AND IT'S JUST TEMPORARY AT THIS POINT. >> TEMPORARY AT THIS POINT. BUT IF I LOOK AT THIS AND DECIDE, "EHH, DON'T LIKE THOSE COLORS," I CAN PICK SOMETHING ELSE. THEN THE TOP OF MY BASIC BLOCK IS ANOTHER SMALL BLOCK. THIS COMES FROM A DIFFERENT SET, BUT IT'S ALSO 1 3/4-INCH STAMP. I COULD'VE DONE THIS. I COULD'VE USED THIS. OR I COULD'VE USED ONE OF THESE AS WELL. SO NOW I HAVE A BASIC BLOCK, WHICH LOOKS JUST LIKE THIS. >> MM-HMM. >> AND THIS, THEN, IF WE GO TO MY LITTLE SAMPLE HERE, HERE IS-- I HAVEN'T FUSED THOSE DOWN. I DO HAVE SOME ORIENTATION MARKS, SO I KNOW WHERE THE CENTERS ARE OF EACH SIDE, AND MY SHAPE JUST--YOU START ALWAYS IN THE MIDDLE LIKE THIS. >> AND I SEE WHY YOU LEAVE THAT LITTLE 1/16 OF AN INCH. IT'S THIS COLOR SEPARATION. >> NOW, I COULD CHOOSE TO PUSH THESE TOGETHER AND NOT LEAVE THE GAP, BUT I LEFT THE GAP HERE. YOU CAN SEE THE BLACK FABRIC. THE NEXT STEP, IF I WANTED TO DO A MEDIUM-SIZE BLOCK, WHICH YOU'RE SEEING HERE, IS I WOULD FIND--I WOULD MAKE ANOTHER BASIC BLOCK, AND I WOULD CUT IT INTO 4 TRIANGLES 'CAUSE IT JUST CUTS WITH YOUR ROTARY CUTTER. >> EDGE TO EDGE. >> EDGE TO EDGE. AND VOILA, YOU HAVE LITTLE TRIANGLES, AND THEY SIT RIGHT HERE. AND THAT MAKES A BASIC BLOCK. IT'S AS EASY AS THAT. >> SO THIS SIZE, AND THEN IT CAN GOT TO THIS SIZE OR EVEN LARGER. >> IT CAN BECOME LARGER, WHICH IS THE MIDDLE, AND WE DO THAT BY HAVING 2 BLOCKS THAT ARE IDENTICAL THAT YOU SEE HERE. AND YOU CUT THEM JUST ONCE, AND THIS WILL MAKE A LARGE TRIANGLE. >> UH-HUH. OUR LARGE TRIANGLE. >> THERE ARE SOME INTERESTING PERMUTATIONS YOU CAN DO OF THIS. FOR EXAMPLE, YOU CAN JUST FLIP THESE AROUND AND LEAVE NEGATIVE SPACE AND GET--BUT SEE HOW DIFFERENT THESE ALL ARE BASED ON THE--THE STAMP DESIGNS YOU'RE USING, THE COLORS YOU USE. >> NOW, DID YOU, UH, DID YOU JUST, UH, ADHERE THIS TO THE BACKGROUND, OR DID YOU-- IS IT SEWN? >> WELL, I'M NOT PRECISE ENOUGH TO BE ABLE TO LAYER THESE ON ONE PIECE OF HAND-DYED FABRIC, SO I DO MY BLOCKS, AND THEN I PUT-- I COULD EITHER PUT THE SPRAY-- SPRAY ADHESIVE AND POSITION THEM THAT WAY AND PIN THEM, OR I COULD ACTUALLY PUT ANOTHER FUSIBLE ON THE BACK OF THAT AND THEN POSITION THEM SO EVERYTHING'S NICE AND EVEN. SO THAT'S HOW YOU CAN DO WHAT APPEARS TO BE VERY COMPLICATED PIECING WITHOUT PIECING OR SEWING A SINGLE STITCH. >> WHAT A GREAT TECHNIQUE. THANK YOU SO MUCH FOR SHARING THAT WITH US. >> YEP. YOU'RE VERY WELCOME. >> YOU KNOW, CASEY, I THINK THERE'S NOTHING BETTER THAN TO EITHER HAVE THE FLORIST DELIVER YOU A BEAUTIFUL CENTERPIECE TO YOUR WORK, AND THEN YOU TAKE IT HOME AND USE IT OR BRING IT TO YOUR HOUSE, AND I THINK YOU JUST APPRECIATE THE OVERALL BEAUTY. BUT WHEN I SEE YOU PUT THESE TOGETHER, I REALIZE HOW MANY DIFFERENT ELEMENTS ARE INVOLVED. >> SO TRUE, AND WE'RE KIND OF GOING ON A MONOCHROMATIC THEME THIS TIME WITH THE FLOWERS THAT WE'VE PICKED, BUT YOU WANT TO PICK FLOWERS THAT HAVE A SIMILAR VASE LIFE FOR--THAT THEY'LL LAST ABOUT THE SAME AMOUNT OF TIME, AND IF YOU'RE NOT SURE HOW TO GO WITH COLOR--SOME PEOPLE ARE AFRAID--DOESN'T KNOW WHAT GOES WITH WHAT, BUT YOU KNOW WHAT? YELLOW. JUST GO WITH ALL YELLOW OR GO WITH ALL PINKS OR ALL REDS. >> MONOCHROMATIC. >> YOU CAN'T GO WRONG. AND MAYBE ADD A LITTLE BIT OF SOMETHING, SO WE HAVE A LITTLE BIT TODAY OF THIS LITTLE SPLASH OF ORANGE, WHICH ARE CALLED SAFFLOWER, AND IT JUST PUNCHES IT UP A LITTLE BIT SO IT'S NOT JUST TOO MUCH YELLOW. AND, OF COURSE, WITH THE SUNFLOWERS THAT WE'RE USING AND THEN THESE MINI MUMS THAT ARE MIMICKING THEM ALMOST, WE'VE GOT THAT NICE DARK CENTER, TOO, THAT SORT OF TAKES AWAY THE ALL-YELLOW LOOK. >> WELL, AND I THINK FALL IS SUCH A WONDERFUL TIME TO DO FLORAL ARRANGEMENTS BECAUSE I LOVE ALL THE FALL COLORS. >> I DO, TOO. THEY'RE VERY RICH. >> THEY MAKE PRETTY ARRANGEMENTS. OK, SO THIS IS WHAT WE'LL END WITH, HOPEFULLY, AND HOW DO WE GET STARTED? >> THIS IS OUR CLEAN SLATE WE'RE GONNA START WITH, AND IT'S ACTUALLY REALLY SIMPLE. WE'VE GOT A PAPIER-MACHE CONTAINER, WHICH CAN BE POPPED INTO A BASKET OR INTO MAYBE A LOVELY POT THAT YOU MIGHT HAVE THAT HAS A HOLE IN IT THAT YOU WOULDN'T BE ABLE TO PUT FLOWERS IN. SO I WANTED TO SHOW THIS PAPIER-MACHE. IT'S SOMETIMES NOT THAT GLAMOROUS ON ITS OWN, BUT ONCE YOU HAVE FLOWERS IN IT, IT SORT OF DISAPPEARS. >> AND IT KIND OF GOES WITH IT. >> IT DOES. >> THE GREEN. >> THE GREEN GOES WITH IT. BUT WE USE THESE A LOT FOR LINERS FOR BASKETS 'CAUSE BASKETS CAN'T HOLD WATER, SO OUR RULE IS WATER-TIGHT AND INEXPENSIVE BECAUSE WE WANT TO SPEND THE MONEY ON THE FLOWERS. >> OH, YOU BET. >> RIGHT. SO WHAT WE'RE GONNA DO TODAY, WE'RE GONNA BUILD THIS BASE ON ALL OF OUR ELEMENTS, SO WE'RE GONNA START WITH THE SUNFLOWERS BECAUSE WE HAVE MOST OF THOSE. THEY'RE BIG FLOWERS, AND THEY'RE GONNA BE OUR MAIN FOCUS--FOCAL POINT, ANYWAY, SO WE'RE GONNA PLACE THOSE AROUND FIRST AND GET OUR SHAPE OF OUR CENTERPIECE. AND WHEN YOU'RE WORKING WITH FLOWERS LIKE THOSE, YOU DON'T WANT TO GO TOO HIGH WITH THEM. WE JUST WANT TO MAKE A NICE, ROUND SHAPE. WE'RE GONNA START WITH THAT. AND WE'RE USING FLORAL FOAM, WHICH IS A GREAT MEDIUM. IT'S ALREADY BEEN SOAKED AND IT'S CUT TO SIZE IN HERE, AND WE TOOK A WHOLE BRICK AND THEN CUT IT TO SIZE, AND THEN WE SAVED WHAT WE DIDN'T USE FOR ANOTHER ARRANGEMENT A LITTLE BIT LATER ON. SO WE'RE GONNA START WITH OUR SUNFLOWERS. >> IS IT USUALLY THE CASE THAT YOU START WITH THE BIGGEST? >> YES, BECAUSE ESPECIALLY IF YOU'VE GOT FLOWERS LIKE HYDRANGEA OR PIANESE. USUALLY THE FLOWERS THAT HAVE BLOOM AT THE END OF THE STEM ARE CALLED FOCAL FLOWERS OR FACE FLOWERS, AND THOSE ARE YOUR USUALLY YOUR MORE EXPENSIVE ONES AND YOU WANT THEM TO BE SHOWCASED, SO YOU WANT TO PLACE THOSE FIRST AROUND SO THAT YOU KNOW THEY'RE GONNA BE SEEN, AND THEN YOU FILL IN WITH EVERYTHING ELSE. SO THAT'S HOW WE'RE GONNA DO IT TODAY. AND SO I'M LOOKING FOR SOME OF OUR BIGGER ONES HERE, AND THESE ARE REALLY STILL GONNA BE OPENING A LITTLE BIT AS THEY GO ALONG BECAUSE WE WANT SOME OF OUR BIGGER ONES ON THE OUTSIDE AND THEN SOME OF OUR SMALLER ONES MORE ON THE INSIDE. >> FOR THE CENTER. >> RIGHT. SO I THINK THIS ONE'S A GOOD CANDIDATE, AND I DON'T WANT TO GO TOO HIGH BECAUSE THAT WOULD BE SILLY, SO WE WANT TO TAKE MOST OF IT OFF. ACTUALLY, I'M GONNA GO TO HERE, AND THEN I'M JUST GONNA PLACE INTO THE FOAM... >> ON THE SIDE. >> ON THE SIDE. WE'RE JUST GONNA SORT OF BUILD AROUND THAT SIDE. I THINK HE MIGHT STILL BE A LITTLE BIT ON THE LONG SIDE. I'M GONNA CUT A BIT MORE OFF AND GO BACK IN THE SAME HOLE. THAT'S A BETTER SHAPE. >> FOAM IS SO GOOD... >> IT IS. IT IS SO NICE. SO WE'RE JUST GONNA GO AND TRIM AND BASICALLY GET OUR 4 CORNERS SORT OF SITUATED HERE, AND THEN ONCE I GET THIS MOVING, WE'LL ADD A FEW MORE. >> AND BY TRIMMING YOUR FOAM, IT JUST CREATED THOSE--THAT PATTERN FOR WHERE YOU'RE PUTTING THESE FLOWERS. >> IT DID 'CAUSE IT'S EASIER TO GO, YES, INTO A FLAT SIDE THAN A LITTLE POINTY END THERE. SO THAT'S OUR BEGINNING JUST TO GET OUR BASICS, SO THAT'S WE KNOW HOW OUR SHAPE IS GONNA GO, BUT WE HAVE 10 OF THESE, SO HERE'S ANOTHER ONE HERE, SO I MIGHT PUT THIS ONE COMING UP LIKE THAT, AND THEN WE'RE GONNA DO A COUPLE COMING OUT THERE, SO LET ME CUT A COUPLE FOR YOU THERE. MAYBE THESE GUYS. GREAT. AND TURN THAT. YOU CAN PUT THAT ONE IN THERE, AND I'LL PUT THIS ONE IN HERE. ALREADY IT'S COMING TOGETHER. AND PUT THAT ONE STRAIGHT UP IN THE MIDDLE FACING OUT THAT WAY. YEP. AND I'LL DO ONE OVER HERE FACING OUT THAT WAY. >> OH, I SEE. >> ALL RIGHT, SO WE HAVE THIS GREAT LITTLE SHAPE ALREADY GOING THERE. >> I WOULD CALL THAT FINISHED. >> THAT COULD BE FINISHED ALREADY, BUT WE'RE GONNA ADD MORE TO IT, AND AT THIS POINT, WE'RE GONNA SOME OF OUR GREENERY. AND YOU CAN USE ANY GREENERY. SOMETIMES GREENERY YOU GET FROM THE GARDEN THAT YOU HAVE OUT BACK, SOME BUSHES, OR THEY SELL GREENERY SOMETIMES AT FLORIST SUPPLY STORE. WHAT I LOVE IS USING ROSEMARY BECAUSE SO MANY FLOWERS DON'T REALLY HAVE A SCENT ANYMORE 'CAUSE THEY ARE COMMERCIALLY GROWN, AND THEY'RE GROWN FOR THEIR LONGEVITY, FOR THEIR COLOR, PEST RESISTANCE, SO SOMETIMES THE SCENT GOES AWAY. SO SOMETIMES ADDING A SCENT WOULD BE REALLY FUN, SO SOMETHING LIKE ROSEMARY, AND AS YOU'RE CLEANING IT, YOU'RE GONNA BE PULLING THE LITTLE BRANCHES OFF THERE, AND YOU'RE JUST GONNA POKE THIS ALL AROUND, AND WE'RE JUST GONNA SORT OF POKE IN WHEREVER THERE'S ANYTHING--HOLES MISSING. SO I'M GONNA PREP THESE FOR YOU. AND JUST GO AHEAD AND SPIN IT AROUND AND ADD TO IT. I'M GONNA ADD SOME MORE. AND WE CAN GO ALL OVER THE PLACE. THAT ONE THERE. AND THEY'RE A LITTLE BIT ON THE LONG SIDE, SO WE'RE JUST GONNA TRIM THE PIECES THAT WE NEED AND PLACE THOSE. THERE WE GO. [CHUCKLES] >> THIS IS A NICE THICK ONE. >> OOPS. SMELLS LIKE WE'RE COOKING. >> I KNOW IT. I LOVE TO SMELL ROSEMARY. >> I DO, TOO. ROSEMARY'S GOT LOVELY PROPERTIES, AND IT ALSO IS LONG-LASTING, SO IT DOES WELL IN THE FLORAL FOAM AS WELL. >> OH, UH-HUH. THAT WAS AN INTERESTING POINT YOU MADE THAT I HAD NOT THOUGHT ABOUT BECAUSE I HAVE RECEIVED ARRANGEMENTS BEFORE, AND SOMETIMES ONE FLOWER WILL JUST DIE THE NEXT DAY, AND THE OTHERS LOOK PRETTY AND SO, OF COURSE, YOU CAN REMOVE IT, BUT WOULDN'T IT BE NICE TO HAVE THE WHOLE ARRANGEMENT LAST ABOUT THE SAME AMOUNT OF TIME? >> I AGREE. AND THIS COMBINATION SHOULD DO JUST THAT. NOW, THESE LOOK LIKE AN INTERESTING FLOWER BECAUSE THEY'RE ALL-- >> I THOUGHT IT WAS A TULIP. >> I KNOW. THEY'RE STILL NETTED, BUT THESE ARE CALLED SPIDER MUMS, AND I'LL UNLEASH THEM-- YOU CAN SEE THEM HERE, AND WHAT HAPPENS IS IF THEY'RE PACKAGED LIKE THAT, ALL THE PETALS GET ALL CROSSED UP TOGETHER, AND YOU TRY TO PULL THEM APART, AND THE PETALS ALL GO FLYING. SO IT'S BEST TO BUY THESE WHEN THEY'RE STILL NETTED LIKE THIS. SO FOR THESE, ONE STEM--AGAIN, THEY ARE CONSIDERED A FACE FLOWER. WE'RE ONLY USING 5 IN HERE, AND THEY'RE GONNA GO IN A LITTLE BIT DEEPER AS WE HAVE THERE, TUCKED IN TO HIDE SOME OF THE FLORAL FOAM AND TO NOT BE SO SHOWY BECAUSE WE REALLY ARE ABOUT THE SUN-SUNFLOWERS. SO I'M GONNA CUT ONE AND SHOW YOU, AND WE'RE JUST GONNA POP IT IN HERE WITH THE NETTING STILL ON. >> OH, LEAVE THE NETTING ON. >> NETTING ON, THEN ONCE YOU GET IT THERE, YOU HOLD IT WHERE IT IS, AND THEN YOU RELEASE THE NETTING AND YOU FLUFF OUT THE FLOWER. >> OH, HOW PRETTY. UH-HUH. >> I'LL GIVE YOU SOME OF THESE TO ADD IN THERE. SO ANYWHERE-- >> OK. WE'RE DOING 5. >> YEP, WE'RE DOING 5. YOU CAN JUST GO RIGHT AROUND. GOOD. >> THAT IS--IT'S ALMOST LIKE MAGIC WHEN THEY OPEN UP. DOWN HERE. >> OK. >> AND MAYBE--YEAH, RIGHT OVER THERE. PUT ONE THERE. THAT'S PERFECT. GREAT. ALL RIGHT. IT'S COMING TOGETHER. >> I LOVE THOSE SPIDER MUMS. >> THOSE WILL CONTINUE TO OPEN. SO THEY'RE STILL REALLY FRESH, AND SO THEY'LL CONTINUE TO OPEN AND SPREAD THEIR WINGS, SO TO SPEAK. THEN WE HAVE--THESE ARE CONSIDERED SPRAY FLOWERS OR CLUSTER FLOWERS, AND WHAT THESE DO, YOU HAVE ONE STEM, AND IT'S EXTRAORDINARY, BUT ON ONE STEM, GET THEM UNTANGLED, YOU HAVE ALL OF THESE BLOOMS ON THERE. AND SO HOW THESE WORK IS YOU CUT AWAY ALL THE LITTLE MINI BRANCHES AND USE THEM INDIVIDUALLY. >> AND THESE ARE FILLER? >> THIS IS FILLER FLOWER, AND IT TAKES A LITTLE BIT OF TIME TO PLACE THEM ALL, BUT ACTUALLY, IT'S QUITE FUN, AND THEN YOU JUST SORT OF POKE 'EM ALL AROUND. YOU CAN CLUSTER THEM TOGETHER JUST TO MIMIC HOW THEY GROW, OR YOU CAN JUST PUT ONE HERE AND THERE, SO WHAT WE DO, THOUGH, WE'VE ALREADY CUT THE BULK OF 'EM OFF, BUT WE DO NEED TO GIVE THEM A QUICK LITTLE TRIM BEFORE WE POP THEM IN THERE. >> AT AN ANGLE, SO WE WANT TO GO AHEAD AND DO THAT. >> YES, SO I'M GONNA GIVE YOU SOME OF THESE TO DO THAT. AND GIVE THESE GUYS A LITTLE TRIM, AND YOU CAN GO--THEY CAN STICK A LITTLE BIT HIGHER JUST BECAUSE THEY'RE A LITTLE FULLER. THAT ONE KEEPS JUMPING OUT. >> AND THEN AS WE-- >> I WAS GOING TO ASK YOU LIKE THIS. THESE ARE JUST PERFECT TOGETHER. CAN WE GO AHEAD AND USE THAT? >> IT MIGHT BE A LITTLE TALL, AND THEN YOU'D HAVE TO DO IT A LITTLE TRIM, BUT I WOULD PROBABLY CUT THEM APART. >> OH, OK. >> GONNA PLACE THESE AROUND. GIVE THEM ANOTHER TRIM. IF THEY'RE REALLY SMALL BUDS, THEN THEY CAN SORT OF BE IN THE MIDDLE AND STICK A LITTLE BIT HIGHER BECAUSE THEY'RE NOT SO LARGE. AND THEN YOU'D WANT TO PUT SOME OTHER ONES. AND WHEN YOU'RE DOING AN ALL-AROUND ARRANGEMENT, IT'S REALLY HANDY TO HAVE A LAZY SUSAN TO PUT IT ON AND SPIN IT AROUND. >> CAKE DECORATING OR SOMETHING. >> MY DAD MADE ONE FOR KIT AND ME AND MOM, SO IT'S REALLY FUN TO HAVE THAT TO SPIN IT AROUND BECAUSE YOU'RE GONNA BE HAVING IT BEING SEEN FROM ALL ANGLES. >> AND YOU NEED TO BE ABLE TO SEE IT. >> YES. AND SOMETIMES GET LOW AND WHAT MIGHT BE MISSING. JUST SLIDE YOUR LITTLE GUYS RIGHT IN THERE. FILLING UP NICELY. >> IT IS. I WOULDN'T HAVE THOUGHT THAT IT WOULD'VE HELD THIS MANY FLOWERS. >> THAT'S THE OTHER THING ABOUT FLORAL FOAM. IT IS VERY FORGIVING IN THAT WAY THAT YOU CAN JUST KEEP IMPALING THE STEMS IN IT, AND IT'LL SEEM TO MANAGE, BUT YOU DO HAVE TO REMEMBER TO ADD WATER LATER ON. ALL RIGHT. I THINK WE'RE GOOD WITH THOSE. LET'S ADD A LITTLE OF THE SAFFLOWER BEFORE WE RUN OUT OF ROOM. AND SAFFLOWER IS GREAT. LOOKS LIKE SAFFRON, WHICH IS THAT COLOR, BUT IS NOT THE SPICE. BUT IT COMES ALSO LIKE-- >> IT'S A CLUSTER. >> A CLUSTER. SO WHAT YOU WANT TO DO IS JUST TRIM AWAY THE INDIVIDUAL STEMS AGAIN, AND WE SLIDE AWAY THE GREENERY. MAKE IT EASIER. AND THEN WE POP THOSE IN THERE, TOO. >> IT'S GOT THE YELLOW-- THIS ONE'S ALMOST ALL YELLOW. BUT SOME OF THEM JUST ADD THAT LITTLE TOUCH, JUST A LITTLE-- >> LITTLE BIT OF ORANGE THERE. >> THIS ONE WILL OPEN. >> THAT ONE--AND THEY DO, INDEED, STILL OPEN. GIVE YOU THOSE 2 AND THEN JUST MOVE 'EM AROUND AND ADD 'EM WHERE THEY NEED IT. A FEW MORE-- >> I LOVE THE YELLOW IS SHOWING. I MEAN, THE ORANGE IS SHOWING. >> MM-HMM. THIS IS CUTE. IT'S GOT A LITTLE BUD ATTACHED, SO WE CAN STICK THAT ONE RIGHT IN THERE. AND AGAIN, JUST-- >> IT'S LOOKING GOOD. >> SO FUN. HERE'S ANOTHER ORANGE ONE. AND ONE MORE LITTLE ORANGE ONE OVER HERE. THAT'S BEAUTIFUL. >> I THINK WE NEED ONE RIGHT-- THIS ONE WAS JUST A BUD. >> THERE YOU GO. THERE YOU ARE. [CHUCKLES] >> OH, LOVE IT. >> THAT LOOKS GREAT. >> OH, IT IS PRETTIER THAN WHEN I WANTED YOU TO STOP ORIGINALLY. >> IT'S HARD TOO TO STOP, BUT WITH THIS KIND OF ARRANGEMENT, EVENTUALLY YOU HAVE TO STOP 'CAUSE YOU RUN OUT OF ROOM. >> RUN OUT OF ROOM. WELL, THESE ARE BEAUTIFUL AND, OF COURSE, ANYONE WOULD APPRECIATE GETTING ONE OR IF YOU MADE ONE FOR YOUR OWN HOME. THANK YOU SO MUCH. >> YOU'RE WELCOME. >> I HOPE YOU ENJOYED THE SHOW TODAY. NEXT TIME ON "CREATIVE LIVING," WE'LL BEGIN A NEW SERIES OF SHOWS FEATURING LOTS OF INTERESTING GUESTS WHO ARE EXPERTS IN DIFFERENT AREAS. I ALSO WANT TO REMIND YOU TO SIGN UP FOR OUR FREE "CREATIVE LIVING" NEWSLETTER THAT COMES OUT THE FIRST PART OF EACH MONTH. JUST GO TO OUR WEBSITE AT KENW.ORG, O-R-G, AND PROVIDE US WITH YOUR EMAIL ADDRESS. I DO WANT TO THANK YOU FOR LETTING US BE A PART OF YOUR TELEVISION VIEWING THESE LAST FEW MONTHS AND REMEMBER TO LET YOUR LOCAL PUBLIC TELEVISION STATION KNOW THAT YOU APPRECIATE THEM CARRYING "CREATIVE LIVING." 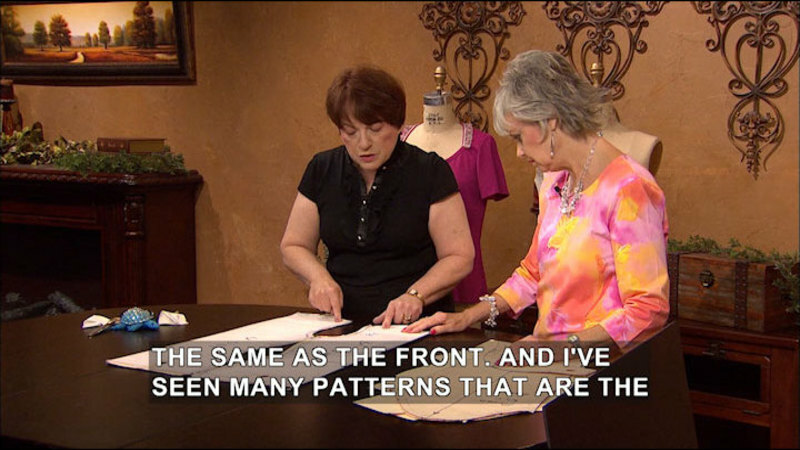 AND JUST A QUICK REMINDER THAT YOU CAN GET THE INSTRUCTIONS, PATTERNS, AND RECIPES FOR MOST OF THE GUESTS WHO'VE BEEN ON OUR SHOW THIS SERIES BY GOING TO OUR WEBSITE AND CLICKING ON THE BOOKLET SECTION. YOU CAN DOWNLOAD THE ENTIRE 6600 SERIES BOOKLET OR JUST THE SECTIONS YOU'RE MOST INTERESTED IN. AND FINALLY, IF YOU EVER HAVE COMMENTS OR SUGGESTIONS OR IDEAS FOR SHOWS, YOU CAN EMAIL ME AT SHERYL.BORDEN@ENMU.EDU. I'D ALSO LIKE TO ASK YOU TO BECOME A FAN OF "CREATIVE LIVING" ON FACEBOOK. 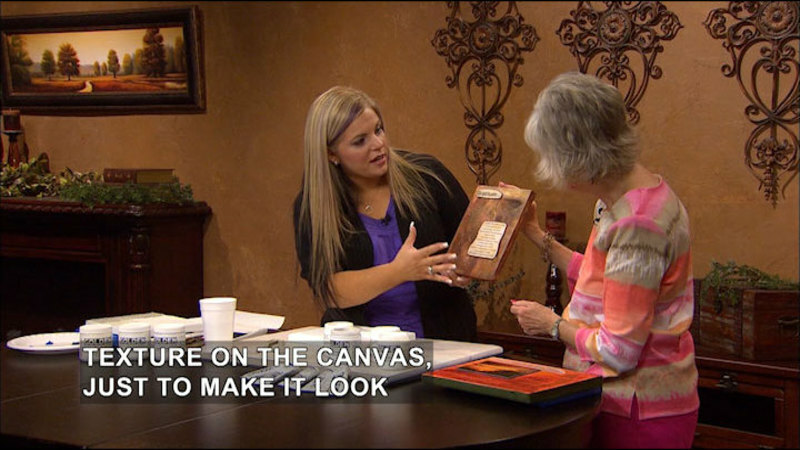 JUST GO TO FACEBOOK.COM AND IN THE SEARCH WINDOW, TYPE IN "CREATIVE LIVING WITH SHERYL BORDEN." THANKS SO MUCH. I HOPE YOU'LL PLAN TO JOIN ME NEXT TIME FOR "CREATIVE LIVING." >> WE ARE VERY PLEASED TO OFFER A NEW BOOKLET THAT ACCOMPANIES THIS SERIES OF "CREATIVE LIVING." THIS BOOKLET IS TITLED "THE 6600 SERIES," AND IT FEATURES A WONDERFUL COLLECTION OF IDEAS AND INFORMATION, AND IT'S AVAILABLE FREE OF CHARGE ON OUR WEBSITE. POSTED AS A PDF FILE, YOU CAN SIMPLY DOWNLOAD THE ENTIRE BOOKLET OR JUST THE SEGMENTS YOU'RE MOST INTERESTED IN. AS WITH ALL OF THE "CREATIVE LIVING" BOOKLETS, YOU'LL FIND INFORMATION ON FOODS AND NUTRITION, CLOTHING AND FASHION, HEALTH AND BEAUTY, HOME DECORATING AND MUCH MORE. FOR YOUR COPY OF THIS BOOKLET, GO TO OUR WEBSITE AT KENW.ORG AND THEN CLICK ON CREATIVE LIVING. SCROLL DOWN TO THE BOOKLET SECTION, AND YOU CAN CLICK ON THIS BOOKLET OR ANY OF THE OTHER BOOKLETS WE HAVE AVAILABLE ONLINE. ONCE AGAIN, JUST GO TO KENW.ORG, CLICK ON CREATIVE LIVING AND DOWNLOAD THE BOOKLET TITLED, "THE 6600 SERIES." WE ALSO WANT TO ENCOURAGE YOU TO SIGN UP FOR OUR FREE E-NEWSLETTER. JUST CLICK ON THE "SIGN UP NOW" BUTTON AND INPUT YOUR E-MAIL ADDRESS. THAT'S ALL THERE IS TO IT. YOU'LL ENJOY READING AN UP-TO-DATE NEWSLETTER FILLED WITH INTERESTING TOPICS AND INFORMATION. THANK YOU. In this episode, a floral designer creates a center piece using sunflowers, and Laura Murray uses quilted blocks to enhance home decorating.